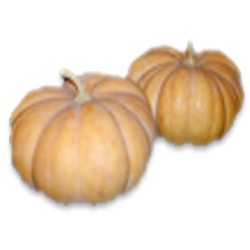 Pumpkin (Cucurbita moschata) is a popular vegetable of Kerala. It is a rich source of potassium and Vitamin A. The bright orange color of pumpkin is an indication of an important antioxidant, beta carotene. Beta-carotene is the precursor of vitamin A in the body, which performs many important functions in overall health. The name pumpkin is originated from "pepon" the Greek word for "large melon." Central America is the centre of origin of pumpkin. Pumpkin requires a minimum temperature of 18oC during early growth, but optimal temperatures are in the range of 24–27oC. It can tolerate low temperatures and are adapted to a wide variety of rainfall conditions. Pumpkin tolerates a wide range of soil but prefers a well drained sandy loam soil that is rich in organic matter. The optimum soil pH is 6.0–6.7, but plants tolerate alkaline soils up to pH 8.0. Arka Suryamukhi: High yielding variety released from the Indian Institute of Horticultural Research, Bangalore. Small sized, flat-round fruits with orange colour. Resistant to fruit fly attack. Suitable for growing in Kerala condition during September-January. Arka Chandan: A pure line selection released from the Indian Institute of Horticultural Research, Bangalore. Fruits are round with pressed blossom end. Rind colour green with white patches when immature which turns to light brown upon maturity. Fruits are with thick orange flesh and rich in carotene, and has solid cavity. Fruit weight is 2-3 kg. Average yield is 33 t/ha. Crop duration is 115-120 days. Ambili: High yielding variety released from the Kerala Agricultural University. Average fruit weight is 4-6 kg. Medium sized flat round fruits. Saras: A medium sized pumpkin variety with attractive flesh colour and more flesh content, released from the Kerala Agricultural University. Average yield is 39 t/ha. Highly suited for growing in Thrissur, Palakkad and Ernakulam districts. Suvarna: High yielding variety released from the Kerala Agricultural University. Small sized flat- round fruits with thick orange flesh. Average fruit weight is 3-5 kg. Approximately 1.0-1.5 kg of seeds are required for cultivating one hectare of land. January-March and September-December are the ideal seasons for growing pumpkin. For the rain fed crop, sowing can be started after the receipt of first few showers during May-June. Prepare the soil to a fine tilth by ploughing and pits of 60 cm diameter and 30-45 cm depth are taken at a spacing of 4.5 x 2 m. Well rotten FYM and fertilizers are mixed with topsoil in the pit. Sow four or five seeds in a pit at 1-2 cm depth. Deeper sowing delays germination. As seedlings require ample water for quicker germination, a pre-sowing irrigation 3-4 days before sowing is beneficial. Irrigate with a rose can daily. The seeds germinate in about 4-5 days. Unhealthy plants are removed after two weeks and only 3 plants are retained per pit. 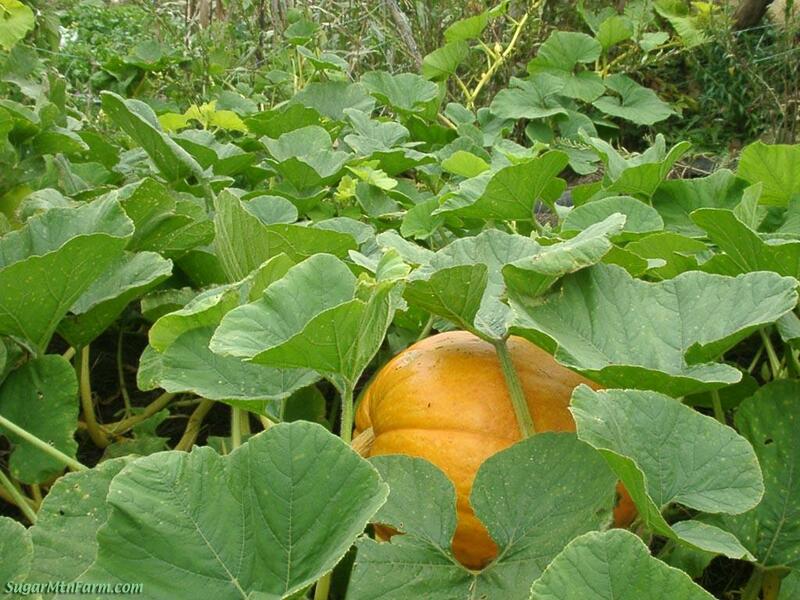 Pumpkin grows very fast and vines elongate rapidly within two weeks after planting. Thereafter, the plant sends out lateral stems. Usually, pumpkin is grown trailing on the ground. For trailing them, spread dried twigs on the ground. Balanced fertilization is essential for high yielding and good keeping quality of the fruits. Apply FYM @ 20-25 t/ha as basal dose along with half dose of N (35 kg) and full dose of P2O5 (25 kg) and K2O (25 kg/ha). The remaining dose of N (35 kg) can be applied in two equal split doses at the time of vining and at the time of full blooming. A fertilizer dose of 70:25:25 kg N:P2O5:K2O/ha in several splits is recommended in Onattukara region. The fertilizer dose per pit would be 28:10:10 g N:P2O5:K2O. During the initial stages of growth, irrigate at 3-4 days interval, and alternate days during flowering/fruiting. Furrow irrigation is the ideal method of irrigating. But in water-limited envi­ronment, trickle or drip irrigation can be resorted to. During rainy season, drainage is essential for plant survival and growth. Conduct weeding and raking of the soil at the time of fertilizer application. Earthing up is done during rainy season. Hand or hoe weeding can be performed as needed. Mulching is commonly used for pumpkin crops grown on raised beds. Use organic or plastic mulch depending on availability. Mulch can be laid down before or after trans­planting and after sowing. Control: Bury any infested fruits to prevent the build up of fruit fly population. In homestead gardens, covering the fruits in polythene/paper covers help to prevent flies from laying eggs inside the fruits. Breaking of soil to expose pupae, and burning the soil in pit by dried leaves are also effective. It can also be effectively controlled by the use of banana fruit traps. The disease appears as small, round, whitish spots on leaves and stems. The spots enlarge and coalesce rapidly and white powdery mass appears on the upper leaf surface. Heavily infected leaves become yellow, and later become dry and brown. Extensive premature defoliation of the older leaves resulting in yield reduction. Pumpkins are ready to harvest when the stems connecting the pumpkin to the vine begin to shrivel. Harvest the fruits whenever they are a deep, solid color (orange for most varieties) and the rind is hard. Pumpkins that are not fully mature or that have been injured do not store well. Cut pumpkins from the vines carefully, using pruning shears or a sharp knife leaving 3-4 inches of stem attached. Snapping the stems from the vines results in fruits without stem attached, which reduce the storage life. The crop yield can vary depending on vari­ety and crop management. Average marketable yields are 30 t/ha. Avoid cutting and bruising the pumpkins when handling them. Wash and dry the harvested fruits thoroughly, and cure for several days in sunlight before storing them. The harvested fruits can be stored for several weeks in ambient conditions. Pumpkins will keep for 2-3 months in temperatures from 10 to 12°C and 50-75 % relative humidity.